Reduction by Walden | Breast reduction surgery by experienced hands. Dr Guy Hingston has nearly 20 years experience as a breast reduction surgeon to draw upon. This magnificent watercolour was presented to Dr Hingston by one grateful woman, six months after her successful bilateral breast reduction. 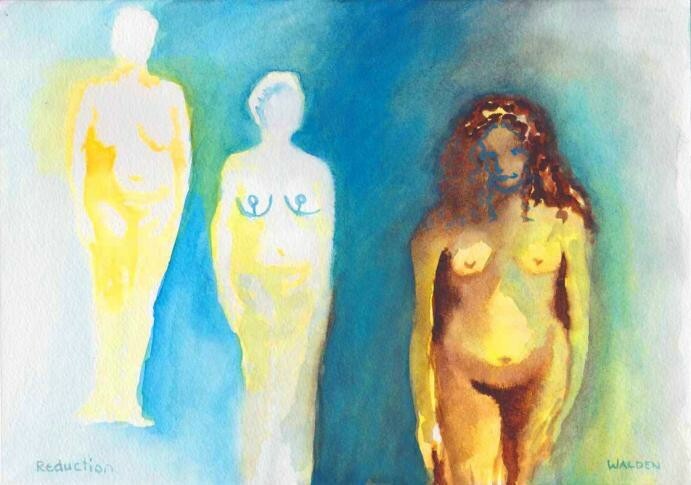 This non-commissioned artwork portrays a journey which visually takes you from the faceless, low self esteem and poor body image that a lot of women with large breasts have, on to the perioperative phase, depicted by fresh surgical scars — with the heated yellow (severe back discomfort) of the first figurine being replaced by the cool blue (shoulder discomfort now gone) above the second woman pictured. Finally a beautiful whole woman emerges, happy, more feminine and complete. The artwork nicely captures the metamorphosis that occurs and the tremendous improvement in quality of life that women enjoy following a bilateral breast reduction (also called therapeutic mammaplasty). Dr Guy has been a fully qualified oncoplastic breast surgeon now for over 20 years. His motto is “Success is to Give” and he continues to enjoy helping women go through this transformation.